Find the best POLi poker sites tested and reviewed by our experts. If you want a way to enjoy online poker without all the waiting times associated with transferring money to and from your account, POLi is a good solution to rely on. POLi is a simple electronic payment method that's designed for its ease of use and to be something that every Australian and New Zealand resident can rely on. When you are trying to play at pokersites, you can really improve your experience by making use of POLi. Most New Zealand and Australia casinos and poker sites, or sites that allow players from those two countries support online poker POLi. That means if you are trying to find a place to play at that takes POLi, you won't have to look very hard. Simply browse around through the available options and you'll see that quality POLi poker sites are all over the place. Update for April 2019: Our top rated POLi poker site is Ignition Poker . One of the main reasons that people enjoy using POLi over other deposit methods such as a traditional bank transfer is that it's very quick. Most deposits can be completed in less than a day. Withdrawals take a bit longer at most casinos but are usually completed within a day or two, this is well ahead of some of the non-electronic deposit methods. When using POLi as your online payment solution you don't have to worry about registering for an account like you do with solutions like Paypal or Ukash. Instead you simply press the button and complete your order through the POLi system. With a bit of basic information you can be on pokersites enjoying what they have to offer. POLi is even easier to rely on than a credit card. When using the solution there isn't much information to enter in at all. Most of it auto fills into the form and you can submit your deposit in just a few minutes. When using a credit card you have to type in the number as well as an address and the security code of the card, it's simply more work. Also credit cards typically take a day or two to process, POLi payments happen almost instantly and you get a receipt to go along with the purchase right after making it. When looking for a real cash place to play, consider POLi poker sites. POLi actually makes it possible to withdraw your money as well as deposit it, this simply isn't possible with a credit card which can only be used to complete deposits. Before you try and use POLi to make payments in AUD or in NZD make sure that your bank account is supported by the service. Not every bank account is and if it isn't supported you'll have to look for a different payment solution to fund your account with, or you will have to open up a new bank account to handle your payments. Either way, you won't be able to get started at Poker rooms right away if you don't have the right bank account. POLi is an Australian company and works in both Australia and New Zealand. While the company plans to expand into other countries in the future, these are the ones that it's supported in at the moment. If you live in Australia or New Zealand it's worth looking into POLi to see if you can use the service to make effective deposits. E-cheques are another popular way that players will put money into their accounts. They work just like standard cheques do, but you don't physically write the check. This method is simple to use and you only need your bank information just like when you use POLi, but the time it takes to use this method is vastly different than the time it takes to use POLi. POLi is faster by far. Where a POLi payment can be processed in less than a day most of the time, an e-cheque often takens multiple days to verify. POLi payments also don't come along with the fees that you will usually pay for an e-cheque. So you'll save money and time by using POLi. POLi isn't the only electronic payment option out there. There are others such as PayPal, Ukash and Neteller, but it is one of the simplest and easiest to use. It's also one of the most affordable. If you're trying to get started with online poker, it is worth the effort to check out POLi and what it has to offer to you. 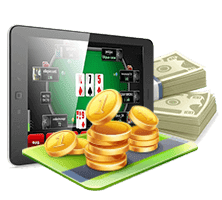 You'll be surprised at how simple it is to use and how much easier it makes getting going with your online poker casino. POLi is a simple electronic payment method that allows you to send payments all over the Internet quickly and conveniently. To use POLi you simply connect your Internet bank account to POLi when completing a payment transaction. No registration is necessary and it's simple to do. Can it be used for online poker? 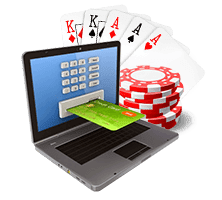 It can very easily be used for online poker and only requires that you have an online bank account in order to complete the transactions. POLi is very safe to use thanks to a set of careful security measures put in place to help protect the customers relying on the service. It is just as safe as any online bank account is. Transactions can usually be completed in a matter of minutes because real money was put into your account. The processing system figures out how much money was put in right away and adds a credit to your account. How do they compare with other payments? POLi is a highly secure service that can be utilized in mere moments. Unlike options such as Ukash, it isn't necessary to travel to a terminal to put money into the account and instead you can go right through your bank account. Do I need to pay fees? There are sometimes fees associated with POLi, but many times it's the provider that will cover the fees for the service rather than the player getting started with a casino. When searching for the best POLi poker sites, we crossed paths with multiple operators that left very bad impressions. The cardrooms were not properly secured, the support services were subpar, and the bonuses were designed to trap new players in.